Another for my list of "I'd like to know more." 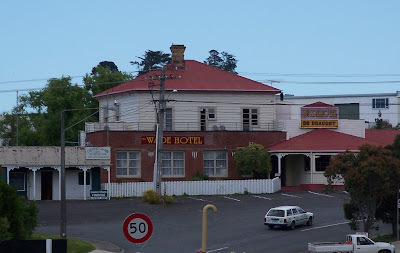 Buck Shelford apparently owned this at one time, according to some of the 'Net pages tonight -- but what's the history behind the Wade Hotel? The centre part of the building looks almost late Victorian-early Edwardian. Is it? Sorry for the less than wonderful photo quality -- I was being safe and taking an optical/digital zoom shot from the other side of the highway today. hmm...it almost likes a bit 1920's to me, the windows on the bottom level give me that impression. I'm going by the cornices just under the roof line. They could be exposed eaves which does, yes, put it in the bungalow-era. But the front windows could well have been modernised. They don't quite seem to match up in line with the ones at the side. I would like to know more as well. My Dad visited this pub and it must have been in the early 1950's. As the harbour bridge was not built until 1959 I am wondering how he got here and as he is no longer with us, I can't ask him. He was working for Postage and Telegraph and I think he was involved in laying the cables. Anybody know anything about this time and the Wade Hotel?